The Hi-Landers is one of the oldest Four Wheel Drive Clubs in the Sacramento, California area. We were founded in 1968 originally as the Hi-Landers Jeep Club. We still have founding members active in the club. The ages of our members range from 21years old up through retired seniors. The club currently has over 95 family memberships. Help us get to the 100 mark. The Hi-Landers Four Wheel Drive Club is a family oriented four-wheel drive club that is open to any one that owns a four-wheel drive vehicle and is over the age of 21 years old. Our club members have a large variety of different makes and models of four-wheel drive vehicles. Some are stock and some are highly modified. Jeeps, early Broncos and early Toyota Cruisers seem to be the most popular. For some of the easier runs the family SUV may also show up. Many of our members also enjoy quads so a club run may have a mix of all types of rigs. The club is a family and community oriented club, some of our yearly community contributions is supporting the Forest Service on the Mormon Emigrant Trail Snow Patrol, volunteer renovation of the South Fork campground, our adopted Poker Run Campground, volunteer security at Hang-Town Races and our December Gold Country Toy Run where all proceeds and toys go to needy kids. On the family side we often rent a Campground for our summer social, a full weekend of family picnic style fun and activities. 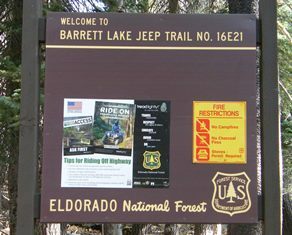 The Hi-Landers maintain an adopt-a-trail in the El Dorado National Forest. It is the Barrett Lake Trail with a 10 (out of 10) rating for the serious four wheeler. We usually run that trail 2 or 3 times each year with work parties starting in early July. The Hi-Landers host an annual Poker Run in June, usually on Father’s Day Weekend. June 2019 will be our 48th Poker Run. Typical attendance is about 100 vehicles and over 250 participants and takes place in the Crystal Basin /Loon Lake bowl area of the El Dorado National Forest. The Club has a general meeting on the second Monday of each month at 7:30 pm held at the Orangevale Recreation Center located at 6818 Hazel Ave, Orangevale, CA. The meeting is open to anyone who wants to attend. Attending a meeting is a good way to find out who we are and what our upcoming calendar looks like. The Club has a monthly run on the fourth weekend of each month. Typically the run is open to prospective members/guests by invitation. Some of our previous runs: Mormon Emigrant Trail snow patrol, CA4WDC Winter Fun, CA4WDC Convention, Reno spring Wild Mustang run, Barrett Lake trail, Rubicon Trail, Summer Social, Bear Vally Loop in Tahoe NF, Autumn fall colors run on local dirt trails, Gold Country Toy Run and our Poker Run. 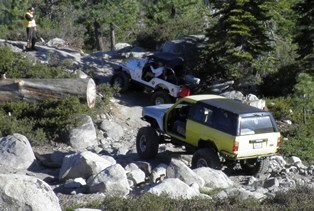 As you see the club runs vary from stock vehicles runs to highly modified rock crawling runs. Our upcoming runs should be similar to the above listed runs. To become a member you need to fill out a membership form (available at any meeting) and submit it with a $2.00 application fee. The prospective member must then drive their 4X4 rig in three club runs and make three general meetings all within a four-month period. At that time a ballot will be held to vote in/out the new member. Our members are charged a $10.00 annual membership fee and must maintain membership in California Association of 4WD Clubs. Our Poker Run registration is now available on line. The Eldorado National Forest has asked us to help inform our visitors about recreation site closures within the Chrystal Basin area. Click her to download a PDF about the closures. The Club has a general meeting on the Second Monday of each month at 7:30 pm. Our meeting is at the Orangevale Community Center located at 6818 Hazel Ave, Orangevale, CA. The meeting is open to anyone who wants to attend. Attending a meeting is a good way to find out who we are and what's on our upcoming calendar of events. Click here to go to CA4WDC's web site.